There’s been quite a long silence, for quite good reasons if I might say so myself. I got married on June 1st (which was preceded by a lot of nervousness and preparations) and then went honeymooning in New York for a bit over a week. The trip will be elaborated upon once I’ve sorted through the 900+ pictures. 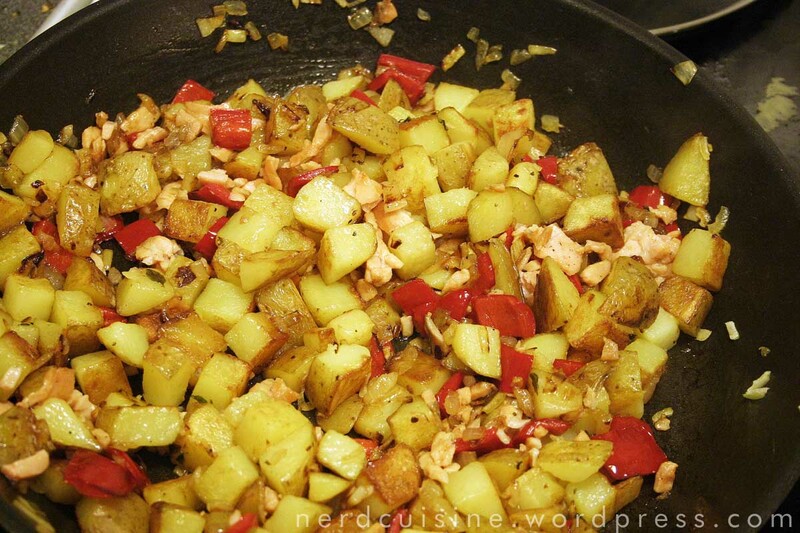 Swedish hash, or pyttipanna, is made by frying neatly diced potatoes and leftover meats along with chopped onions. We were a bit short in the leftover meats department but had some smoked salmon that we got from my wife’s aunt, who was clearing out her fridge. 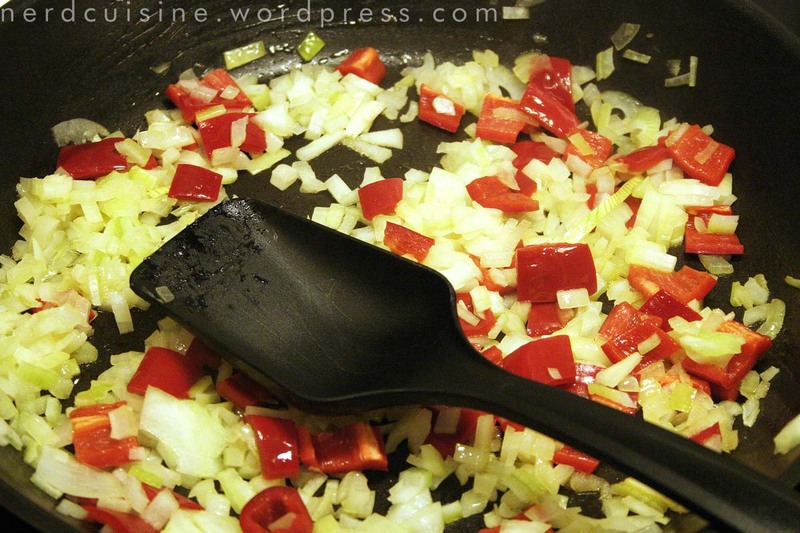 In one pan, onions, fried over medium heat until brown. I added some garlic and red peppers to keep the salmon more company. 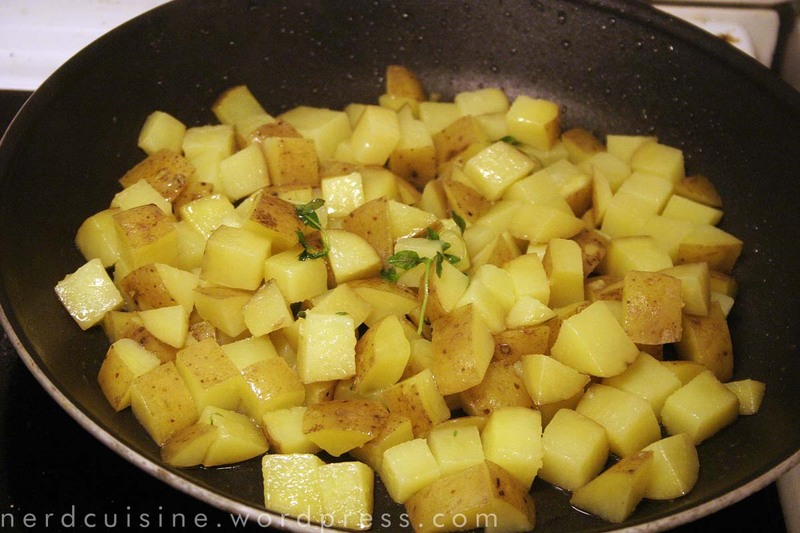 In a second pan, potatoes, along with a sprig of thyme. 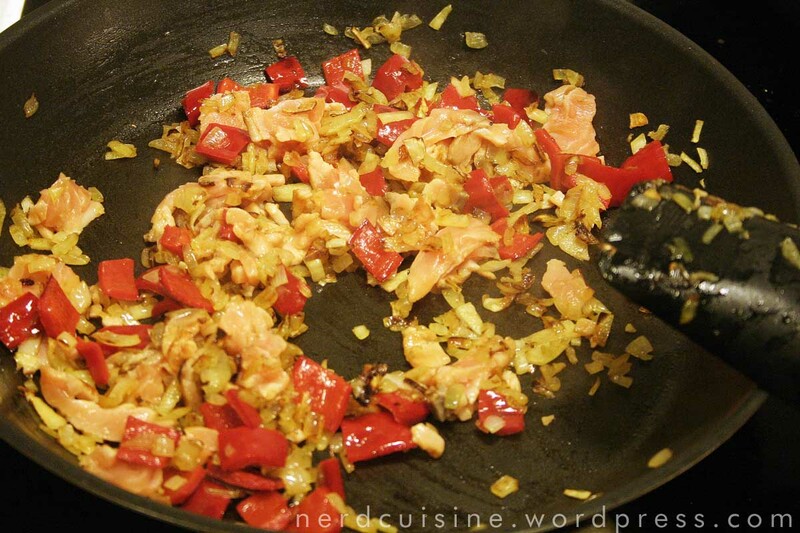 Once everything is more or less cooked, the salmon can be added. It really doesn’t need a lot of pan time, already being smoked. Potatoes tipped in too. Time to season and stir. Pyttipanna is traditionally served with fried eggs and pickled beets (and in recent times often with ketchup and similar) but I decided to manage without. My recent blog posts about blue Swedish potatoes are about to get company by one about some rather yellow Danish ones. Today’s main ingredient is Ratte or Asparges potatoes, originating in Denmark according to Wikipedia. They were bought at the same time as the Blue Congo potatoes and at the same shop. Also very cheap for such lovely spuds. The bag claimed they were good for potato salad, so that’s what I did. A batch of asparges potatoes, boiled in their skin along with a vegetable stock cube. 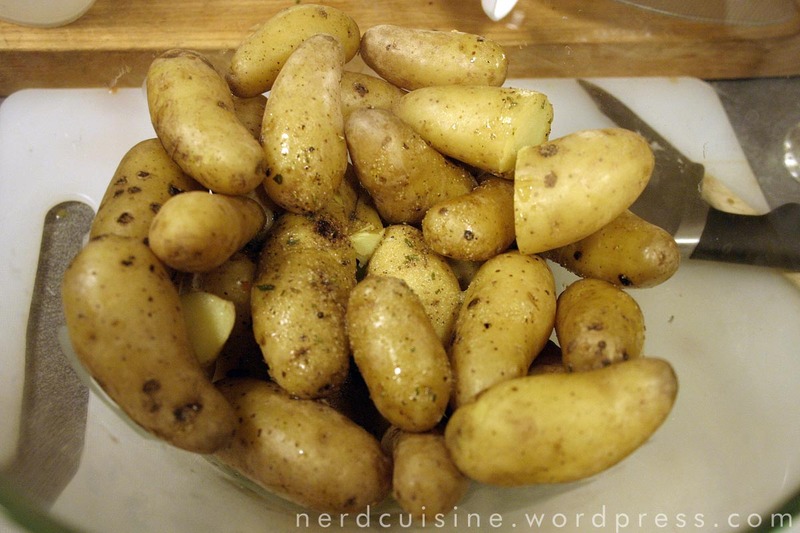 I usually run all the potatoes through with a long pin or similar before boiling, to allow some salt in. 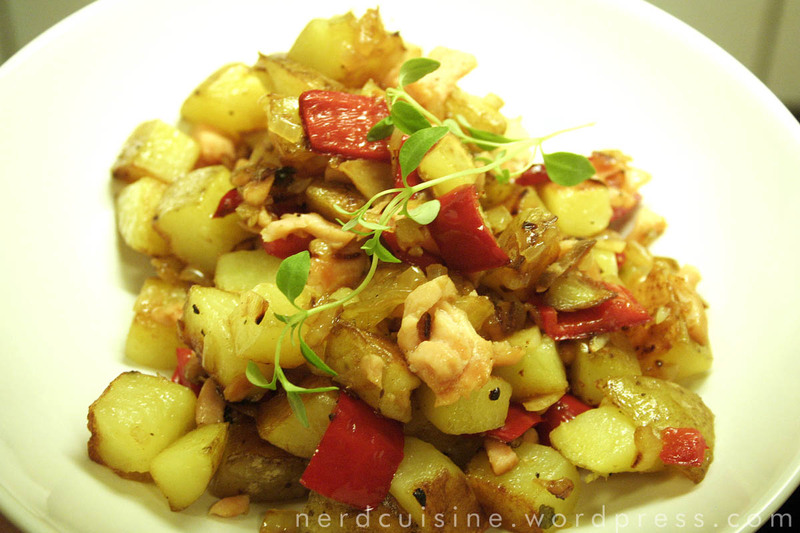 The asparges potato, when boiled, has an almost creamy texture and a flavor with a lot of nutty notes. The protein for the evening. Cheapest possible. 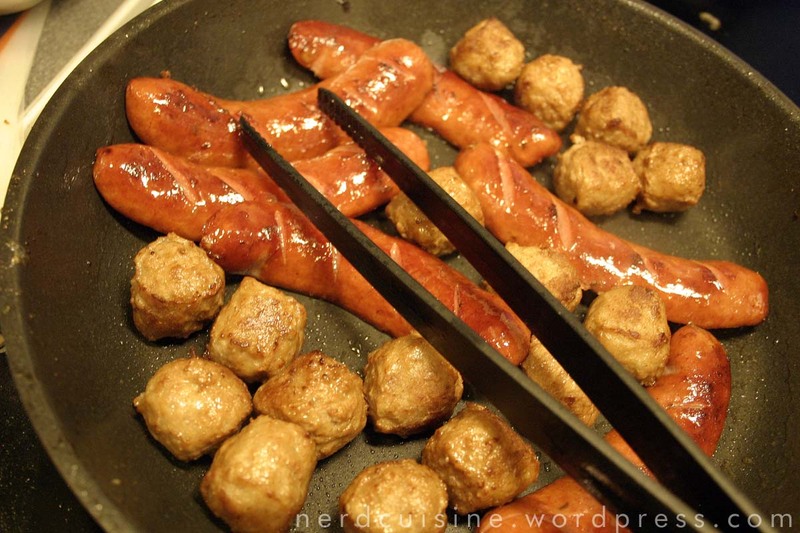 Prefab meatballs and discount sausages in order to make sure there was enough potato salad to make a lunch box. Salad assembled. 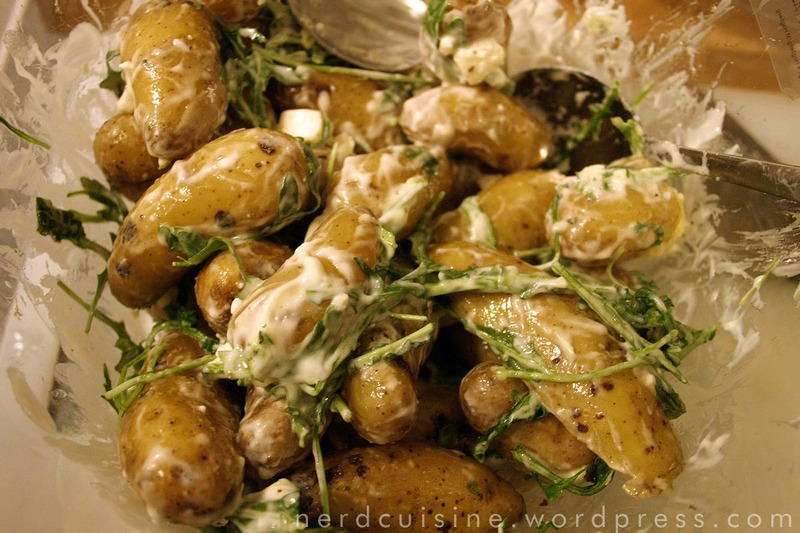 Oil, french herbs, powdered garlic, salt, pepper, mayonnaise, potatoes, arugula, diced feta-like cheese and some capers. Heavenly!